Making it a goal to read four fiction books last month helped me get more books read in July! This first non-fiction book is from my 2016 reading list. Planet Middle School by Dr. Kevin Leman. This book had some helpful advice for parents of middle schoolers (though I feel that Dr. Leman is occasionally crude in some of his language and stories.) I would recommend Sue Acuna’s Middle School: The Inside Story if you were looking for an excellent book on parenting this particular age group. 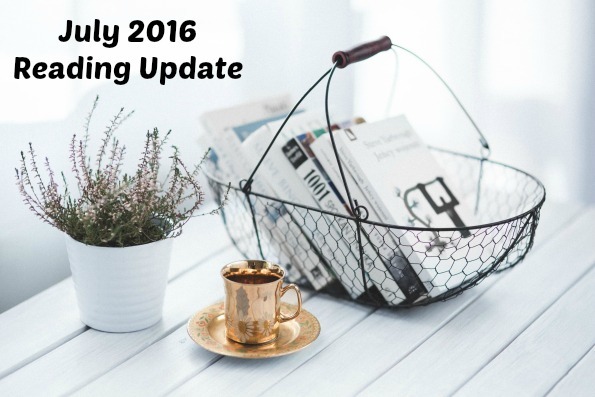 I read two other non-fiction books in July. Unstuffed by Ruth Soukup. I really wanted to read this book after thoroughly enjoying Living Well Spending Less. In Unstuffed, Ruth did a great job of dealing not just with decluttering in every area of your life, but in learning what to value and how to choose the possessions and pursuits that matter the most to you. Be Satisfied by Warren W. Wiersbe. I read a chapter of Ecclesiastes each day for a couple of weeks and used this as a companion book. It really helped bring out some of the truths Solomon shared. Here are the four fiction books I read last month. Sweet Olive by Judy Christie. This is the first book in the Trumpet and Vine series and is a small town story about interesting characters with just a little bit of mystery. I enjoyed it so much that I moved on to the second book in the series! Magnolia Market by Judy Christie. This book was as good as the first one, and I’m hoping there will be a 3rd! Miriam by Mesu Andrews. Read my complete review of this book here. The Witnesses by Robert Whitlow. My husband and I have enjoyed several books by Whitlow, and I really liked this one as well. The story switches back and forth between current day and Nazi Germany. Sweet Olive sounds like a fun book to read! I'm going to see if my library has it. You always read such good books, and they expand my own reading list! I feel the same about the books you read! I always get new titles to add to my reading list from the ones that you share.